Waterloo 200 - Samlerhuset Group B.V. In 2014 the Samlerhuset Group entered a a cooperation deal with Waterloo 200, the official charity sponsored by the UK Government to support the commemoration of the Battle of Waterloo during its bicentenary in 2015. 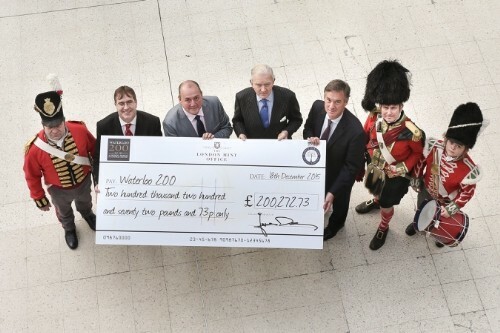 The proceeds from the sales of the Battle of Waterloo commemorative medals, which were produced in conjunction with Worcestershire Medal Service, a Royal Warrant holding company as Medallists to Her Majesty Queen Elizabeth II, raised £200,272.73 for Waterloo 200. “The Battle of Waterloo and its role in forging the Europe we know today should never be forgotten, which is why the government charged us with keeping the memory of The Battle of Waterloo alive. The proceeds from Samlerhuset have helped the organisation deliver its principal commemorative events throughout 2015 and will be used to continue our education project over the next five years. On behalf of Waterloo 200 we extend our sincere thanks to Samlerhuset and Worcestershire Medal Service for this tremendous contribution,” comments Major General Sir Evelyn Webb-Carter.